Blue Mountain Mist Country Inn and Cottages is an elegant bed & breakfast nestled on 60 acres in the foothills of the Smoky Mountains, in Sevierville, Tennessee. 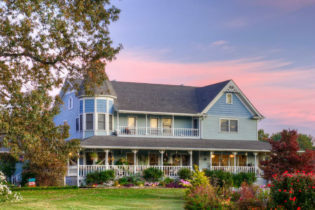 This beautiful Victorian-style farmhouse offers twelve guest rooms filled with antiques and family heirlooms, homemade desserts, free refreshments, and full country breakfasts. We offer onsite massage/spa services and we welcome retreats and groups. The Blue Mountain Mist Country Inn and Cottages is located in Sevierville, Tennessee, just minutes from Gatlinburg, Pigeon Forge, Dollywood, and the Great Smoky Mountains National Park. Wake in the morning to gaze at the colorful sunrise over the mist-covered mountains. Take a nap in a shady hammock without a care in the world. Take a hike along our trail and soak up all the smells and songs of the mountains. Or discover one of our many “hiding” places to unwind with your loved one. Treat yourself or your significant other to a relaxing massage onsite or indulge in one of our mud wraps to revitalize and nourish your skin. We offer beautiful views, romantic rooms, suites and cabins, homemade Southern breakfast, relaxation, and the ultimate in mountain hospitality. Our twelve guest rooms and five cottages include amenities such as two-person Jacuzzis, sitting areas, fireplaces, handmade heirloom quilts, antique furniture, historic photos, and original artwork. 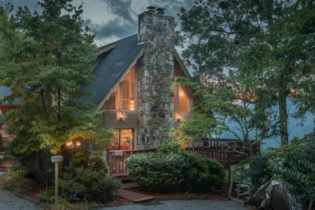 Gracehill, a Tennessee Bed & Breakfast w/a 360 degree view of the Great Smoky Mountains National Park is the highest home in the county and borders the park. We've won awards for gardens, fall foliage, breakfast, and three years in a row "Best Scenic View from a B&B in the United States" says Inn Traveler. Gracehill, a Townsend, TN Bed & Breakfast is near Gatlinburg and Pigeon Forge and adjacent to the Great Smoky Mountains National Park. We are the highest home in the county, with a 360-degree view and have won three years in a row “Best Scenic View From a B&B in the U.S.” in Inn Traveler Magazine. Your privacy is second only to the view. The atmosphere is gracious, and the amenities are luxurious. A beautiful sunrise, an elegant breakfast, a day spent doing nothing or everything and the romance of watching the sun go down over the mountain ranges of the Great Smokies are all within your reach with Black Tie Class and Blue Jean Comfort! Activities set the stage, nature steals the show. In the middle of a triangle formed by Pigeon Forge, Gatlinburg, and Townsend, we are only minutes from all three. In Townsend, the Peaceful Side of the Smokies, you have the natural beauty and serenity of the Cades Cove entrance to the Smoky Mountains National Park. Hiking, biking, fly-fishing, tubing, caving, strolling the bike trail, and touring the Heritage Museum, spend a day at leisure and feel you have stepped back in time. Heading in the other direction, Gracehill is only eleven miles from a “shop till you drop” experience in Pigeon Forge. Music theaters, outlet malls, and Dollywood are but 20 minutes away. Take a shortcut through the National Park and Gatlinburg is 15 miles away. Near the Smoky Mountains you'll find Laurel Springs Lodge Bed and Breakfast, located in Gatlinburg, Tennessee. Two blocks off the Parkway, an easy walk downtown. Only 3 miles from the Smoky Mountain National Park, and 5 miles from Pigeon Forge. Minutes from Horseback Riding, Golfing, Skiing, Rafting, Ober Gatlinburg, and Dollywood. Located in Gatlinburg, TN, Laurel Springs Lodge Bed and Breakfast is a 1930’s B&B near the Smoky Mountains and Pigeon Forge. We are 30 miles from the University of Tennessee, great for that weekend getaway to visit your student at UT or take in a home game. We are minutes from horseback riding, golfing, skiing, rafting, Ober Gatlinburg, and Dollywood. We’re only 3 miles from the Smoky Mountain National Park, and 5 miles from Pigeon Forge. 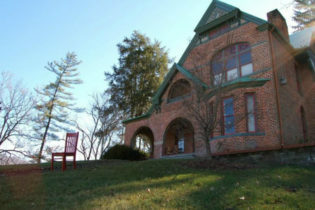 The bed and breakfast is located in town, two blocks from the parkway and light number two. You can take the trolley from that intersection, or take an easy walk into downtown. 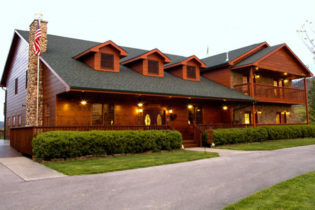 Our setting is a secluded, wooded hillside, overlooking the Little Pigeon River. Gatlinburg is one of the top Honeymoon destinations in the U.S. and Laurel Springs Lodge is a wonderful setting for your romantic Honeymoon. The Lodge was built in 1932 and it operated as Miss McCalley’s boarding house for a number of its early years. It has been totally renovated inside to bring you modern conveniences without ruining the original ambience. 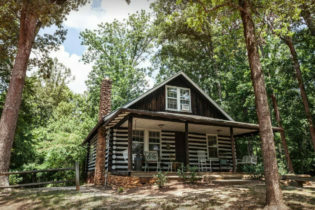 The Lodge is very comfortable with a living room that is rustic with knotty pine walls, comfortable seating areas, and a large stacked stone wood burning fireplace. The front porch is enclosed, one end is used for breakfast and the other has a common/seating area, with an electric fireplace. We have a small but eclectic library, video library, and numerous board games. The gazebo is the perfect place to enjoy the outdoors. We are 200 feet from the Little Pigeon River, which is stocked with trout each Thursday! We serve a delicious gourmet breakfast, served on the dining porch (not buffet style) from 8:00 to 9:30 am. The B&B has five guest rooms, all with private baths and bathrobes, cable TV, VCR and DVD players, mini fridges, premium linens, and botanical bath products. Enjoy the “Old World” Smoky Mountain ambience in our totally renovated historic home. We have central air conditioning, updated plumbing, and free wireless internet. 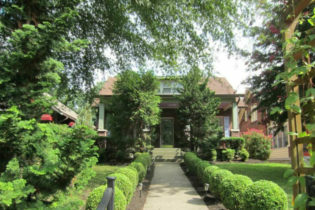 A wonderful alternative to a hotel, the lovely Big Bungalow Bed & Breakfast in Nashville, TN was built in the early 1900’s in historic Edgefield, and sits just east of the Cumberland River and downtown Nashville. Located in a vibrant community famous for it’s stunning houses, exquisite churches, urban flavor and cultural diversity, the Big Bungalow offers just the right mix of urban convenience and a warm, homey atmosphere. The three welcoming guestrooms include private bath, cable TV, free high speed wireless internet access and a large fulfilling bath. Truly experience Nashville – it’s music, history and relaxed pace – while enjoying all the amenities you’d want plus some unique extras not found anywhere else. Right in our own living room! You are invited to hear some of the great musicians and songwriters who give Nashville its reputation as Music City, USA. Four or five songwriters sit in a circle and perform their original songs. It’s your opportunity to be part of the inside music scene in Nashville – who knows, you might hear the next big country hit or meet the next big country star! See the Events section for scheduled music nights. We are also just minutes by car from Music Row, the famed Bluebird Cafe, The Opryland Hotel and the Grand Ol’ Opry as well as the airport, Vanderbilt University and all local hospitals. The Big Bungalow is also just a short drive to the Hermitage, Cheekwood and Belle Meade Mansion as well as many beautiful public parks. For walkers and joggers, Shelby Park is close by. If you’re an antique buff, you won’t want to miss Nashville’s countless antique shops and antique malls in which to lose yourself. 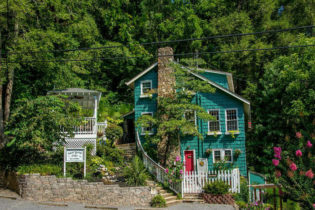 The Foxtrot Bed & Breakfast is a mountain top retreat featuring balconies that overlook downtown Gatlinburg, Tennessee. We offer 4 guest rooms with king-sized beds, a sumptuous breakfast and a variety of spa services for you to choose from. Nestled in the trees at the crest of the mountain in Gatlinburg, Tennessee, the Foxtrot Bed and Breakfast offers spectacular views of Mt. Leconte and the Great Smoky Mountain National Park. The Foxtrot’s chalet-style exterior of cedar and stone fits seamlessly with the surrounding mountains and trees. Watch the sunrise as you sip your morning coffee or tea on one of our decks. Enjoy a peaceful retreat, and bask in the tranquility of nature as you escape every day stress. Your Foxtrot experience begins when you retreat to your plush accommodations or enjoy outstanding vistas from our decks. Wake to the smell of hot coffee and gourmet treats. The multi-course breakfast prepared by a professional chef begins every day at the Foxtrot. Relax by the fire with a book or head for adventure in the Great Smoky Mountain National Park. 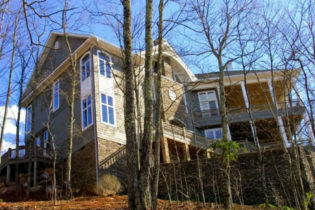 The Foxtrot is minutes from dining, skiing, hiking, shopping, golf, and other Smoky Mountain activities.